Martin Samuelsen is in action for Norway Under 21s over the Easter weekend. Photo: Joe Dent/theposh.com. 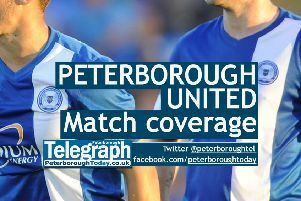 Peterborough United have five players away on international duty over the Easter weekend. Michael Smith is on international duty for Northern Ireland. Photo: Joe Dent/theposh.com. Michael Smith: Wales v NORTHERN IRELAND in Cardiff (friendly). Gaby Zakuani: DR CONGO V Angola (African Cup of Nations qualifier). Kgosi Ntlhe: Brazil v SOUTH AFRICA U23s (friendly). Harry Toffolo: ENGLAND v Canada U20s (friendly). Michael Smith: NORTHERN IRELAND v Slovenia (friendly). Martin Samuelsen: Spain v NORWAY U21s (friendly). Gaby Zakuani: Angola v DR CONGO (African Cup of Nations qualifier).